Beyond providing data for all 32 NFL teams, PFF also supports network broadcasters with game-preview packets that are used to enhance the in-game experience for fans and viewers. This 49ers-Chargers preview features the same information our broadcast partners use for team research and in-game production. The 49ers’ next-man-up at quarterback, C.J. 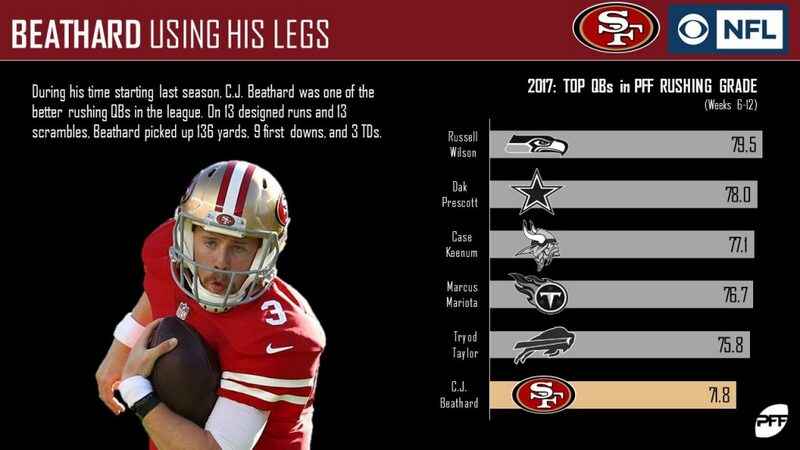 Beathard, succeeds in one area that Jimmy Garoppolo struggled in this season. The second-year replacement quarterback averaged 5.2 yards per 13 rushing attempts in 2017 compared to Garoppolo’s 4.1 on three attempts this year. Beathard’s 71.8 rushing grade adds one more offensive threat to a team that just took a considerable hit. Beathard will see similar quarterback pressure numbers surrendered this season as he saw during his time as the starter a season ago. During his six starts in 2017, the offense allowed 18.5 pressures per game. Throughout 2018, Garoppolo was pressured 16.3 times per game. Beathard should hope to keep improving as a pressured passer since their schedule tightens up as October nears. 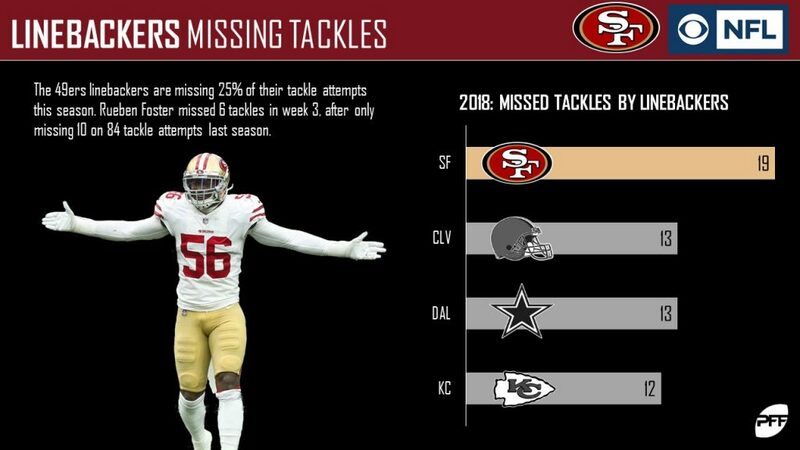 49ers’ second-year linebacker Reuben Foster missed 10 tackles in 10 games in 2017. 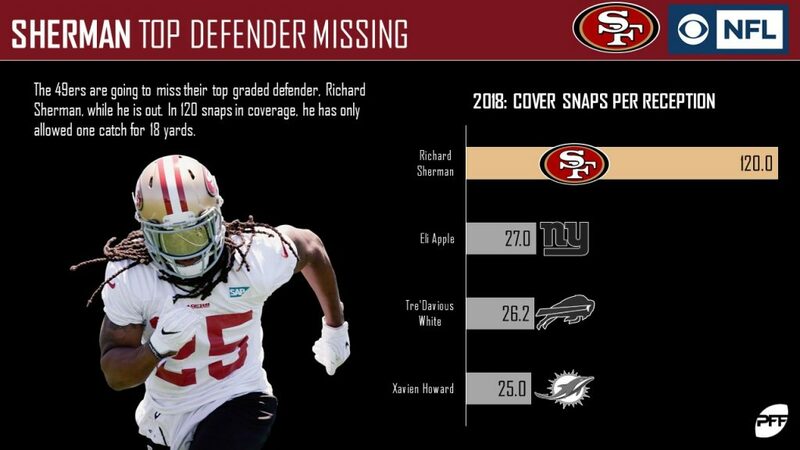 In Week 3 2018, he missed six, adding to San Francisco’s league-high total of 19 solely by linebackers. The 49ers are on pace to miss 229 tackles this year, eclipsing their total of 125 a season ago. Richard Sherman, who has played the second-most defensive snaps on the team, will be on the mend for a few weeks with a strained calf. Jimmie Ward, who has seen just 95 snaps this season, will likely see increased game action. Ward has surrendered 9.7 snaps per reception compared to Sherman’s league-best 120.0. Philip Rivers struggled in multiple aspects of the game in Weeks 1-3 of the 2017 season. 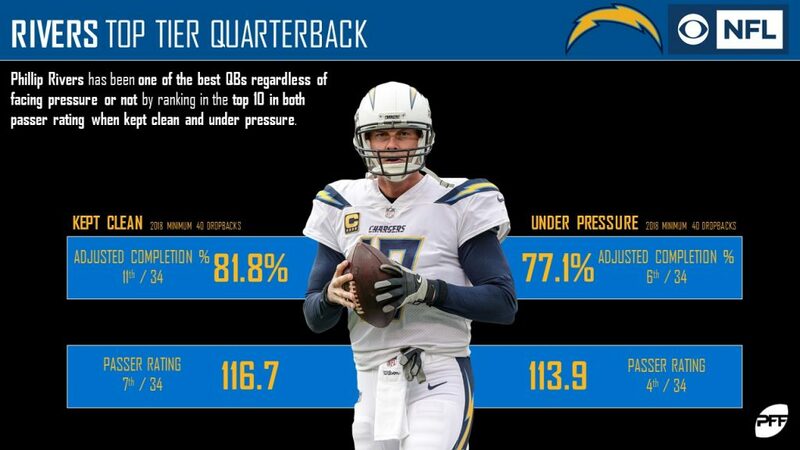 In 2018, Rivers has improved his performances in all four of these categories by a significant amount, including the improvement of his touchdown-to-interception ratio. 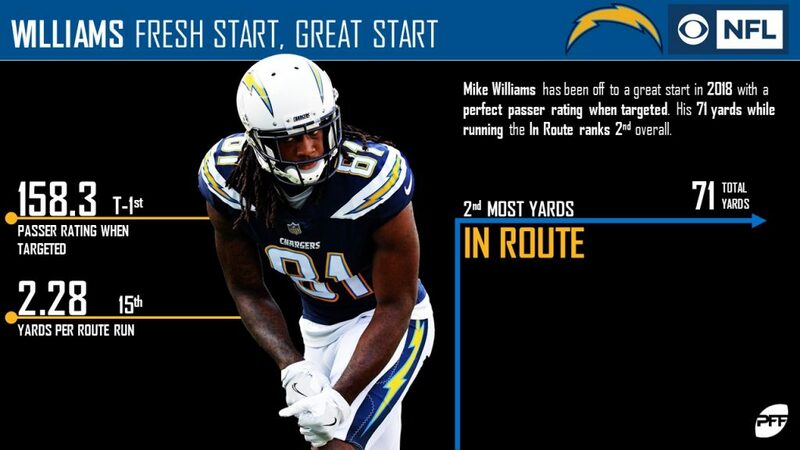 Mike Williams is the Chargers’ only pass-catcher to have a perfect passer rating (158.3) when targeted. The second-year receiver has also amassed 189 receiving yards on 83 routes run, which ranks 15th in the NFL in yards per route run. 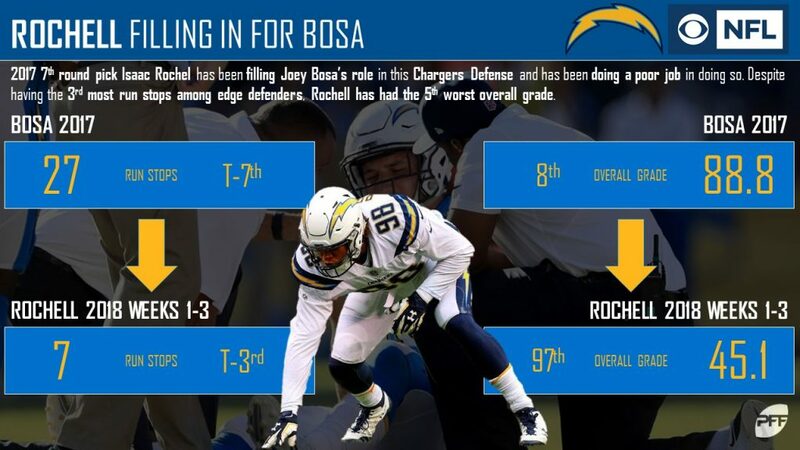 The Chargers’ defense continues to struggle to generate pressure without Joey Bosa on the field. His replacement, Isaac Rochell, has pressured the quarterback just three times this season; tied for 82nd in the league among edge defenders. 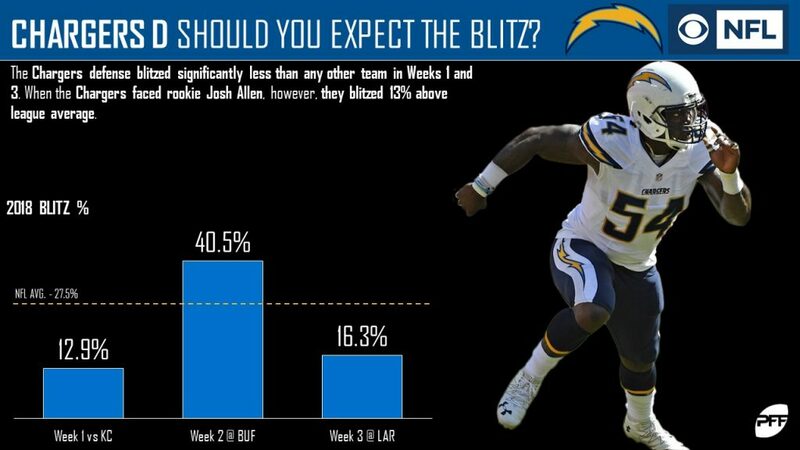 The Chargers have lost any time they blitz below the league average in a game this season. 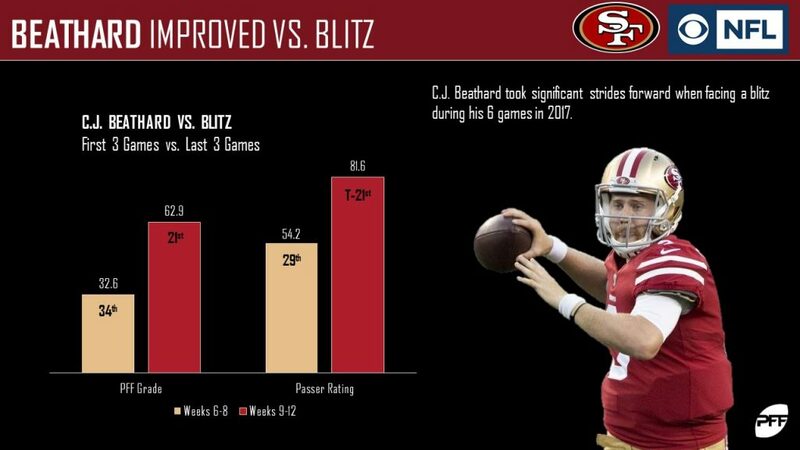 Fans should expect to see a hefty dose of blitzing against the 49ers to take advantage of Beathard’s 49th ranked passer rating when under pressure (42.3) in 2017. PFF Greenline has projections for the spread, moneyline and over/under of the San Francisco 49ers’ matchup with the Los Angeles Chargers. Get its picks here.